1. 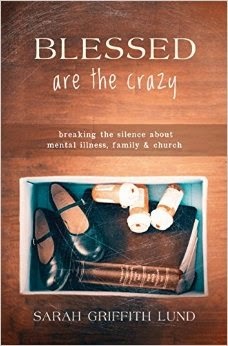 I recently read Blessed Are the Crazy by Sarah Griffith Lund, a short memoir about her family's experience with mental illness. Sarah interweaves stories of both her father's and brother's struggles with bipolar disorder with some of her own faith development particularly during her college years, as well as some of her experiences as a pastor. Her upbringing, made particularly difficult by her father's outbursts, leaves an unavoidable mark on her faith, yet she is still able to take solace in a Christian community and a loving God as she seeks comfort and answers to lingering questions. Sarah's book is intensely personal, and she sets it forth as encouragement for others to tell their own stories of mental illness in order to help remove the stigma and get the support that is so sorely needed for those who suffer from it and their loved ones alike. 2. Like many others, we binge-watched our way through the first season of Unbreakable Kimmy Schmidt this month. Produced by Tina Fey, this show features the title character after she and three other women are freed from an underground bunker, having been held there by a cult leader for 15 years. After an appearance on the Today Show to talk about her ordeal, Kimmy makes the decision to stay in New York and try to build a new life. Along the way, she has to adjust to what society is like after so many years removed from it, as well as selectively share her past with others. Her naiveté sets her back more than once, but she makes it a point to keep moving forward, building off survival tactics she learned in the bunker. The show is quick-witted and had me laughing out loud more than once. The humor is similar to shows like Parks and Recreation and Arrested Development, so I became a fan almost immediately. 3. I've been reading The Interior Castle by Teresa of Avila the past few weeks, a spiritual classic in which Teresa proposes that there are a series of mansions within us. As we journey through each one, we get closer to the center of our being, in which we know ourselves and God within us more intimately. Teresa observes that not many really take the time to do this internal work and miss out on truly knowing themselves, electing instead to chase fleeting desires rather than spiritual health. I've really been enjoying it. 4. Delta Rae's new album After It All released this month. The band is still churning out its folk-rock-country blend, although many of these feature a fuller sound than their previous LP. "Outlaws," "Chasing Twisters," "Bethlehem Steel," "Cold Day in Heaven," and "I Will Never Die" are all hard-driving tunes. Others such as the title track are more anthemic. It's a rich combination of instrumentation that makes for another wonderful outing. Here's Delta Rae performing "Cold Day In Heaven:"
5. I've also been listening to an enjoying Alabama Shakes' new album Sound & Color this week. They continue their unique combination of soul, R&B, and rock, but the guitar is a little more crunchy this time around. They give off a latter-day Black Keys vibe more than once. Here's one of their latest tracks, "Don't Wanna Fight:"